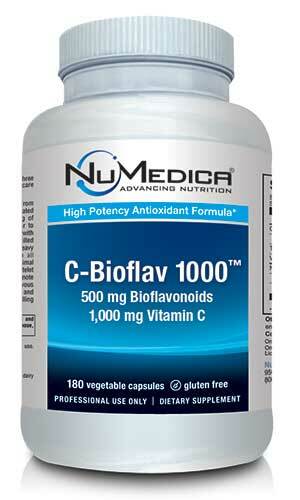 NuMedica C-Bioflav 1000 is a powerful blend of vitamin C and citrus bioflavonoids available in vegetable capsule form. Research has demonstrated that this combination of nutrients provides outstanding antioxidant protection and may also support immune system function and natural collagen production. As a popular nutritional supplement, NuMedica C-Bioflav offers people a potent and nutritionally dense blend that may provide these healthful benefits. Your immune system is your body's defense against disease and a myriad of illnesses such as the common cold. Although our immune systems provide an extraordinary level of defense against disease, they can always be enhanced with nutritional support for optimum function. After all, our immune system may suffer when we're under stress. Some studies suggest that as we age, our immune system may not function as efficiently as when we were younger. NuMedica C-Bioflave 1000 has been designed to naturally support immune system function so that it can do its disease-fighting job. A common vitamin most of us have heard about, Vitamin C, a main component of NuMedica C-Bioflav, has long been touted as a great support in itself for improved immune system function. As one of the most safe and effective vitamins available in supplement form, vitamin C may also provide health benefits like reduced risk for cardiovascular disease, eye disease, and possible even cancer. A recent report from Mayo Clinic even suggested that patients showed marked mood improvement when their vitamin C levels were raise. In addition, vitamin C is linked to improved collagen production, which may result in healthier-looking skin and fewer wrinkles. 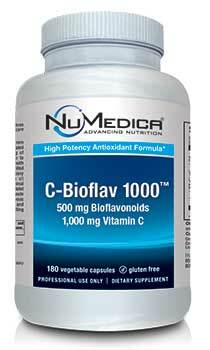 NuMedica C-Bioflav 1000 is rich in citrus-based bioflavonoids. These potent bioflavonoids are linked to improved antioxidant protection (antioxidants fight cells that can lead to disease onset) and also contain antibacterial and anti-inflammation properties. Research has shown that bioflavonoids may help strengthen the walls of blood vessels. In Europe, bioflavonoids are prescribed to treat nose bleeds and even leg ulcers. Other Ingredients: HPMC (vegetable capsule), ascorbyl palmitate, rice flour, silica, MCC (microcrystalline cellulose).